9/17/2010 - Walker recently released new air filter field service kits for AIRSEP equipped marine engines. ONE CALL, ONE PART NUMBER, ONE BOX-- Thats all it takes to get your AIRSEP equipped engine set up for the season with Walker newest Field Service Kits. 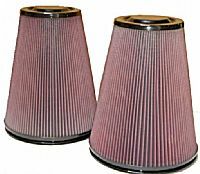 These kits include all the Air Filter elements, filter recondtioning kits, and parts you will ever need to get your engine in tip-top shape. Each kit is packaged with a filer reconditioning kit, and is setup for each engine specifically, so the Series 60 Field service kits include two air filters to equip two (2) engines., The C18 Kit includes a filter for the forward and rear turbos, and the CCE Series 60 kit includes the proper air filter o-rings. So make the call... and order your field service kit today.